Hello everyone! I hope you all will be absolutely fine and having fun. 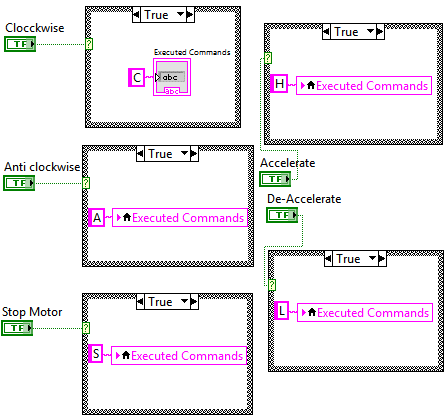 Today, I am going to share my knowledge with all of you guys, about how to make a simple Virtual Instrument (VI) for DC Motor Speed Control in LabVIEW. In my previous tutorials, I have worked on DC Motor Speed Control using Arduino, in which I have controlled the DC Motor Speed using Arduino and after that I made some advancements in it and then created DC Motor Speed Control in Matlab in which commands were sent from Matlab. So, now we are gonna do the DC Motor Speed Control in LabVIEW.If you are working on DC Motor then you should also have a look at DC Motor Direction Control using Arduino. 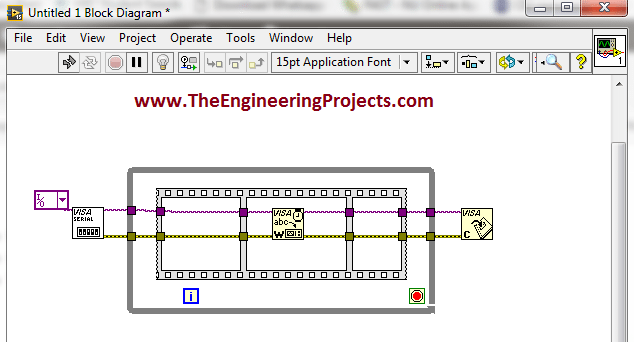 In this tutorial, I am going to work on the program for DC Motor speed Control using NI LabVIEW. So, before going into the detail of this tutorial, you must go through my previous tutorials because I am going to use the same hardware setup and Arduino source code with a bit modification. 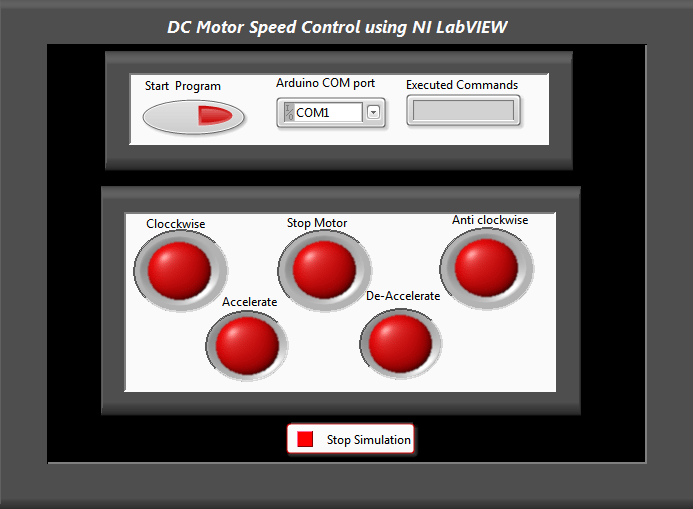 I will made a simple GUI (Graphical User Interface) for DC Motor Speed Control in LabVIEW. There will be five different buttons on the GUI for clockwise rotation, counter clockwise rotation, stopping the stepper motor, accelerating and deaccelerating the stepper motor respectively. In the tutorial DC Motor Speed Control in LabVIEW, I will explain you a complete step by step procedure to control the clockwise and counter clockwise direction of the DC motor as well as accelerating and deacelerating it with the help of the buttons on the GUI created in NI LabVIEW using serial communication between Arduino and NI LabVIEW. 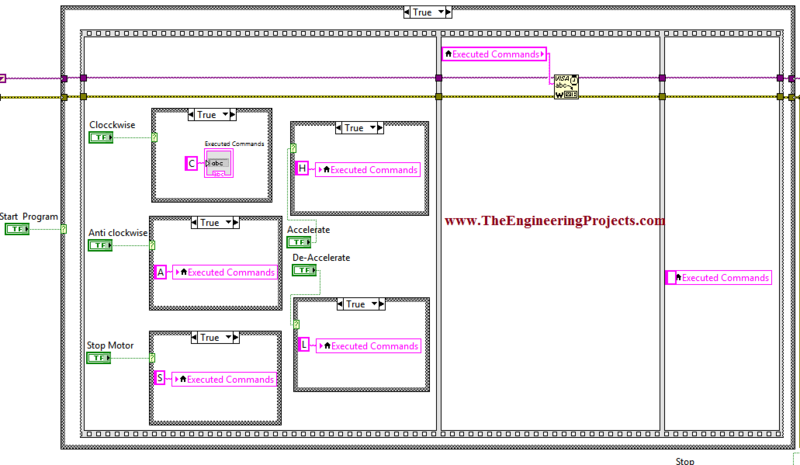 Download .rar file, extract the files from the folder and enjoy the complete DC Motor Speed Control in LabVIEW simulation. First of all I would like you to explain the algorithm of DC Motor Speed Control in LabVIEW with the help of a flow chart. Flow chart for this project is shown in the figure below. 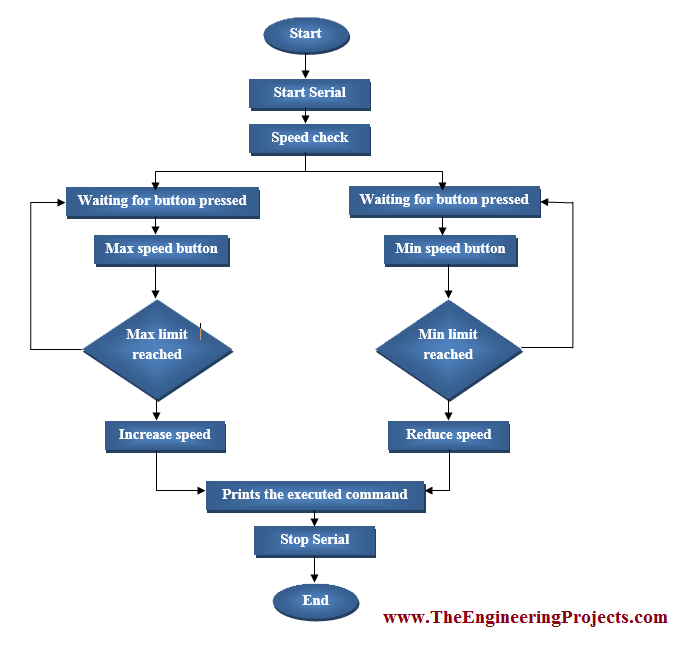 The figure given above can help you to understand the entire algorithm for DC Motor Speed Control in LabVIEW. 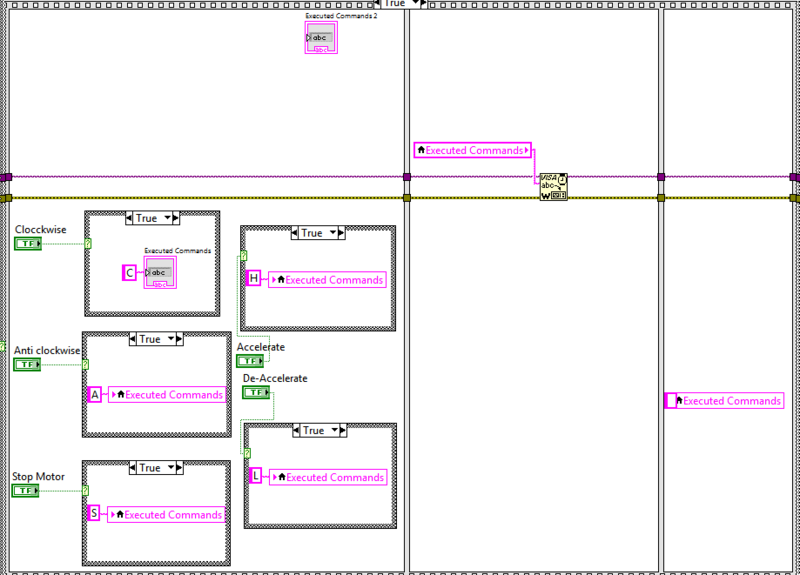 You can see the assembling of all the components used in DC Motor Speed Control in LabVIEW, in the block diagram. 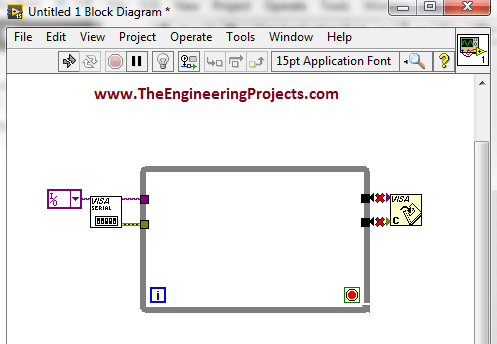 Block diagram for this particular tutorial is shown in the figure below. 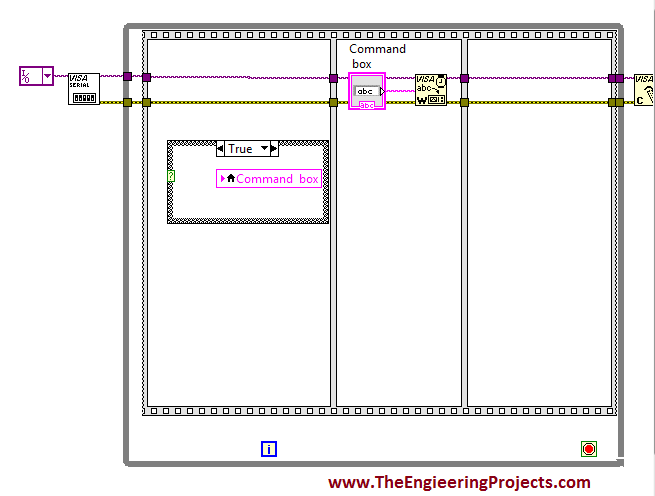 Initially commands are exchanged from NI LabVIEW to the Arduino using serial communication. Then Arduino transfers these commands to L98 motor controller, hence in this way the DC motor. LCD displays the executed commands. 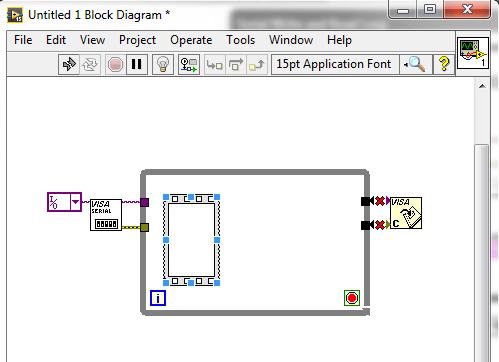 First of all open NI LabVIEW software on your laptop or PC. 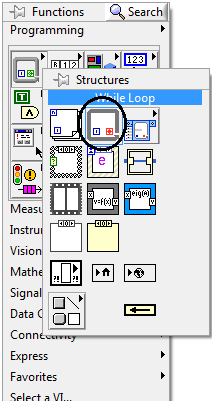 Go to the Block Diagram window and Right Click on it. Go to Functions-> Instrument I/O-> Serial and you can see different serial blocks like VISA Write, VISA Read, VISA Serial etc. Choose the encircled VISA Configure Serial Port and place it on the Block Diagram window. VISA Configure Serial Port block will help us to open the Serial Port before executing the algorithm. 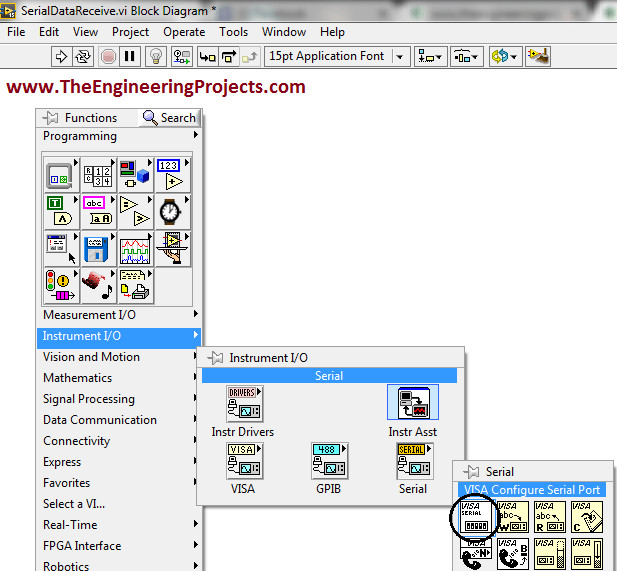 The screen shot of the Block Diagram is shown in the figure below. Go to the first input terminal of the VISA Configure Serial Port block and go to Create-> Control. Above step will be helpful to select the COM port of the Arduino board in order to run the program properly. 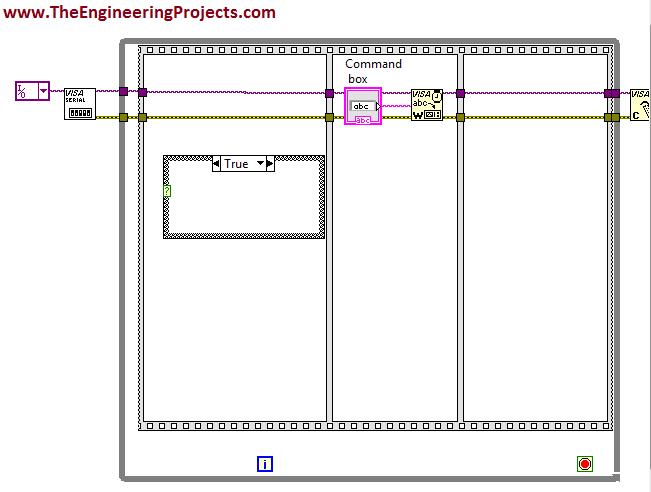 Updated Block Diagram window is shown in the figure below. Now go to Functions-> Instrument I/O-> Serial, you can see there different serial blocks. Choose the encircled VISA Close block and place it on the Block Diagram window. 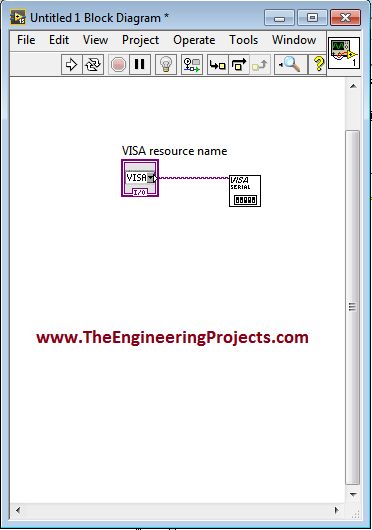 The VISA Close block is shown in the figure below and it will be help in closing the Serial Port if needed. Now, go to the Functions-> Programming-> Structures and you can see the different structures there like For Loop, While Loop, Case Structure etc. Choose the encircled block as shown i the figure below. Place all the above blocks in a way shown in the figure below. Now, go to the Functions-> Programming-> Structures-> Flat Sequence. Flat sequence block is encircled and is shown in the figure below. Put your cursor and go to Add Frame After. Similarly ad another case after this as shown in the figures below. 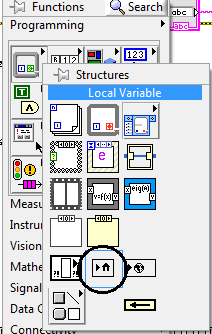 Newly added frame is shown in the figure below. Now, go to Functions-> Instrument I/O-> Serial, you can see different serial blocks there. Choose the encircled VISA Write Block and place it on the Block diagram window. The figure shown below elaborates the above steps. Make the connections as shown in the figure below. Now, go the Functions-> Programming-> Structures and you can see different types of structures like for loop, while loop, flat sequence etc. Choose he encircled block as shown in the figure below. 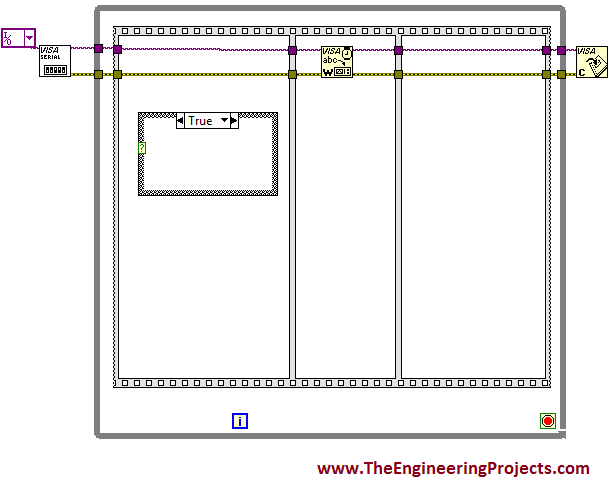 Select the Case Structure block and place it on the block diagram window. The figure shown below displays the above step. Now, go to the input terminal of the write block and go to Create-> Control. Change the name of this block to Command box as shown in the figure below. 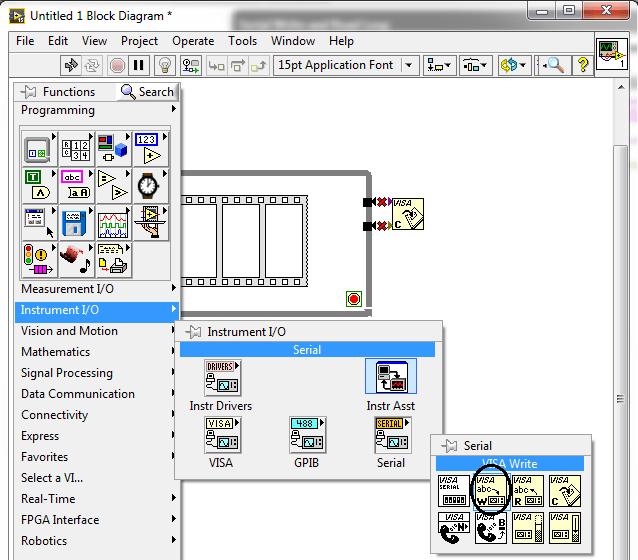 The block diagram window is shown in the figure below. Now, go to Functions-> Programming-> Structures and you can see different structures blocks there. Choose the encircled block as shown in the figure below. Select the Local Variable Block and place it on the Front Panel. 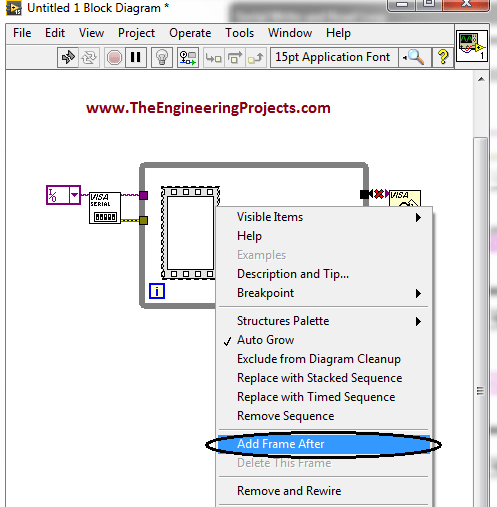 Right click on it and select Command box as shown in the figure below. Go to the input terminal of this local variable and go to Create-> Constant. Place C inside that constant. The figure below elaborates the above step. The above case structure is for the clock wise rotation of the stepper motor. Similarly make four further case structures for counter clockwise rotation, accelerating, de-accelerating and stopping the rotation of the stepper motor. All the three case structures are shown in the figure below. You can see three different case structures in above figure. The command box variable having command C will rotate the stepper motor in clockwise direction. A command box variable having command A will rotate the stepper motor in counter clockwise direction. The command box variable having command H will rotate the stepper motor at higher and higher speed if it is rotating with a lower speed. A command box variable having command L will rotate the stepper motor with slower and slower speed if it is rotating at a higher speed. The command box variable having command S will stop the rotation of the stepper motor. Now, go to the Front Panel and Right Click on it. 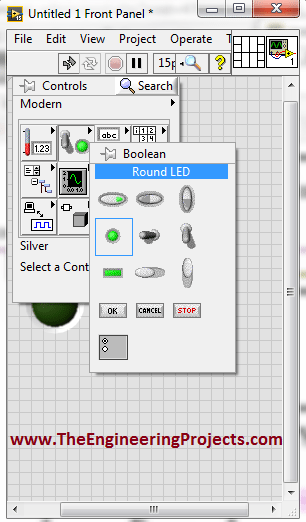 Go to Controls-> Modern-> Boolean and you can see there different Boolean blocks. Select the Round LED block and place it on the front panel. Similarly select two more round LED blocks and place them on the front panel as well. Change their names from default to Clockwise, Anti clockwise,Stop Motor, Accelerate and Deaccelerate. All of the above steps are explained visually in the figure shown below. The LED shown in the above figure will control the stepper motor on clock wise, counter clock wise direction and will stop the motor as well. 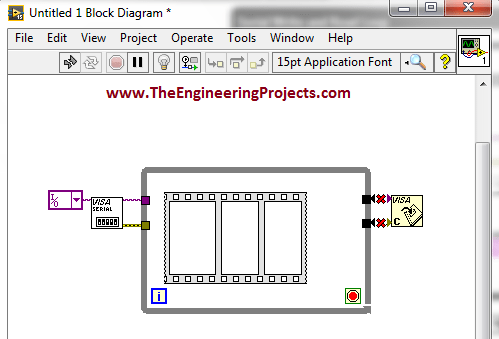 Now go to the block diagram window and connect these blocks as shown in the figure below. At the end, after sending all the commands we must need to close the serial port so that unnecessary exchange of commands could be avoided. So I have cleared the all the commands in third frame of the case structure i.e I am sending no commands through the serial port. This will be helpful in closing the serial port. The figure show below explains all of the above steps visually. Now add another case structure to start the program when you want so. The figure below shows the newly added case structure. 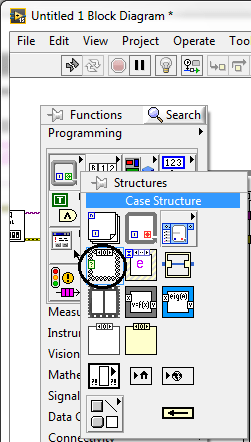 Now, go to the Front Panel, the button encircled in the figure shown below is used to start the program when needed. Now add a Stop button in order to terminate the program whenever you want so. The complete output of the program is shown in the figure below. 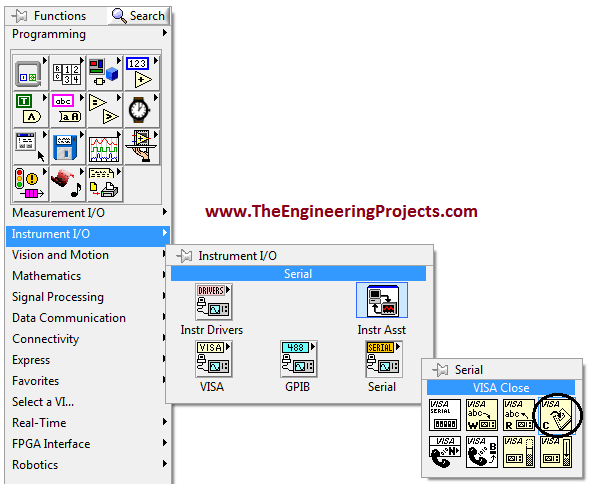 A complete NI LabVIEW Virtual Instrument (VI) is shown in the figure below. I have decorated the front panel to make it attractive for the users. The final look of the Front panel is shown in the figure below. 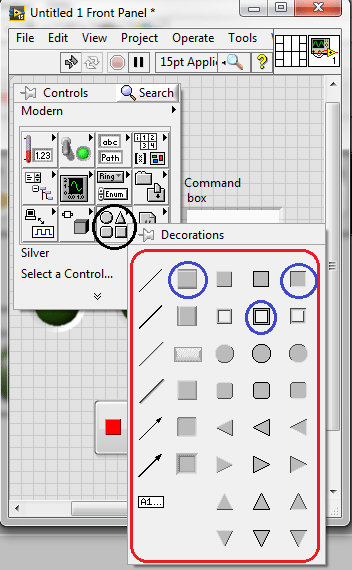 Go to Controls, Modern-> Decorations you can see different decoration blocks there. All these blocks are shown in the figure displayed below. I have used three decoration blocks encircled with the blue color, to decorate my program. Red boundary shows all of the decoration blocks to make your program attractive. You can also decorate your programs using this amazing tools. sir can u give me the circuit connections of dc motor speed control in labview.it means connections with arduino and l298d motor driver. sir in that stop button is not responding. I am also in need of circuit connections sir. please update it also.